A determined group of residents and friends were going to find a way to stop the invasive Phragmites that were infesting the shoreline they love and creating great concern for its future. Bluewater is a condominium community made up of about 115 family homes on the shores of Georgian Bay at the far western limit of Wasaga Beach at the Collingwood border. 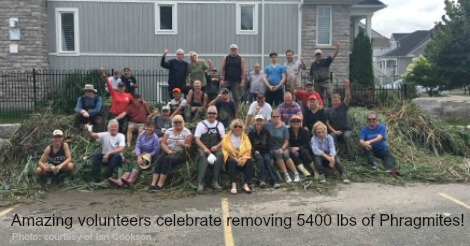 Their board of directors, led by Ian Cookson, and concerned citizens took a number of steps to tackle the problem - culminating in a hugely successful cut that removed 5400 lbs of Phragmites in the summer of 2017! Congratulations to this community who amaze us for their care and guardianship of Georgian Bay and its shorelines. Their fight is not over, but they have taken significant steps to ultimately eradicate this invasive from their shorelines. We hope you are inspired by how they got there, and can take similar steps to protect the shorelines and precious wetland habitat for our native plants and and animals in your Georgian Bay community. Mr. Cookson realized his community had a problem after reading an article "Alien Invader" from On The Bay magazine in the summer of 2016. That article and others in the issue reference a partnership of many organizations and community members including Georgian Bay Forever (GBF), who continue to work in Collingwood and other parts of Georgian Bay to fight this plant and help protect precious coastlines (Info: Collingwood Project). In the fall of 2016, Mr. Cookson contacted Georgian Bay Forever to conduct an informational session for the Bluewater board and interested residents on Phragmites. They then started a plan of action which included instruction on Phragmites shoreline removal techniques at a July workshop put on by Georgian Bay Forever, the Nottawasaga Valley Conservation Authority, and the Blue Mountain Watershed Trust. After learning the process and techniques, the community, under Mr. Cookson's direction and board members Rick Ostofe and Pat Leicester’s leadership, set-up their first cut in mid-August with as many as 50 community members volunteering. And they didn't stop there! That cut addressed about 1/3 of the Phragmites in their area. These community volunteers continued the cutting and removed essentially another 50% of the Phrag in the area. Next year, these stands will be greatly reduced in volume. Special thanks goes out to the Town of Wasaga Beach and their director of public works for stepping up to help residents with the huge job of disposal. This would not have been a success without them. Another big thank you goes out to the Women of Bluewater who showed amazing strength and determination in the heavy work, many of the ladies getting coated head to foot in mud. They were unstoppable! It's hard work, but it will work! Each year, these stands will progressively diminish with each cut until they are gone. Thank you to this community for their outstanding efforts! What can you do? Join your community as a volunteer in 2018! While great progress was made - there is still much need for your help in 2018! We need you, because the stands will come back greatly diminished, but they will still come back. Volunteers are needed to continue fighting these stands until they disappear. Remember the old saying, "many hands, make light work"! Community cuts in Georgian Bay. 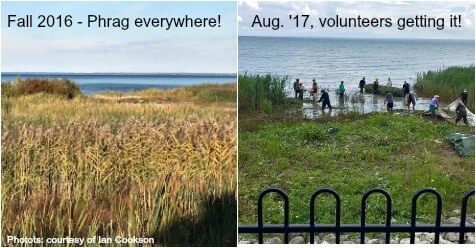 If you would like to learn about managing Phragmites in your community for 2018, please join our email list at this sign-up page. We will notify you of training workshops in the coming year. 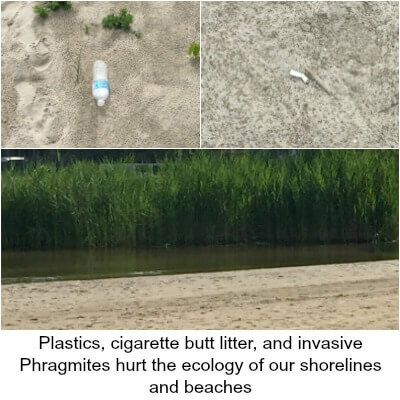 To learn more about invasive Phragmites and the shoreline process for management, please visit our Phragmites home page. There may also be a Phragmites leader in your area of Georgian Bay - please check at Georgian Bay Community Phragbuster Groups. A donation to Georgian Bay Forever will help us to continue to train communities to eradicate this plant and help spread more awareness about the damage it causes to wetlands and habitat. Read about helping beaches in Georgian Bay and Lake Huron, by Jenni Kaija is the Assistant Ecologist for Ontario Parks. Learn about plastics. Our Lakes and Beaches are not garbage cans or ashtrays!